Travel has finally met its match… and it matches your pants. At first, the BauBax travel jacket looks like an average blazer or sweatshirt. But hidden beneath its average silhouette is a mind-blowing lineup of 15 travel-friendly features that expertly handle every need, including ones you didn’t know you had. 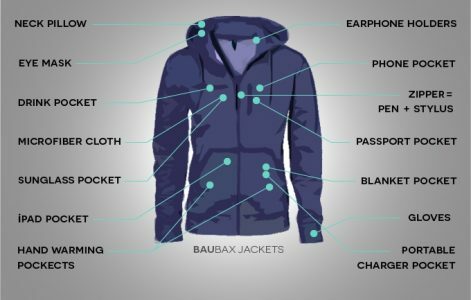 For example, there are nine creatively-placed pockets for everything, including phones, iPads, earbuds, passports and a special mini blanket that you can order with the jacket. The zipper even becomes a pen. To learn more about this amazing new concept, click here.